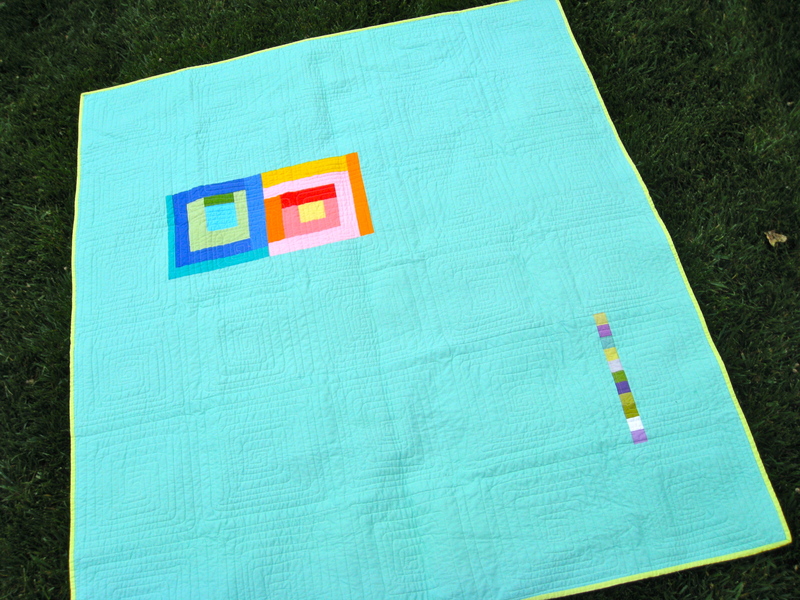 Next up during Week of Solids, we have Shea Henderson’s lovely lively log cabin block quilt. This was my quilt for the Robert Kaufman Kona Challenge. This is my take on Malka Dubrawsky’s “Nate’s Quilt” in her book Fresh Quilting. The blocks in my quilt are larger, but the idea is essentially the same. I just divided the colors up into piles of warm and cool and grabbed whatever fabric was on top and started piecing. Here in Kansas City, we called it the “No Prints Allowed” challenge, so I used my charm pack as the center of the blocks, and used two brights Roll Ups to piece the outer portion of each block. The handful of charms that didn’t make the warm/cool color blocks on the front of the quilt were used in a tiny row of 1″ squares on the back of the quilt– it is one of my favorite parts of the quilt! Piecing improvisationally does not come naturally to me, so this quilt was a fun break from my usual piecing methods. This quilt was also my first attempt at quilting on a long arm machine. I LOVED that! What do you love most about using all solids? There are so many things I love about using solids! My shelves are primarily full of shot cottons, cross weaves and solids. 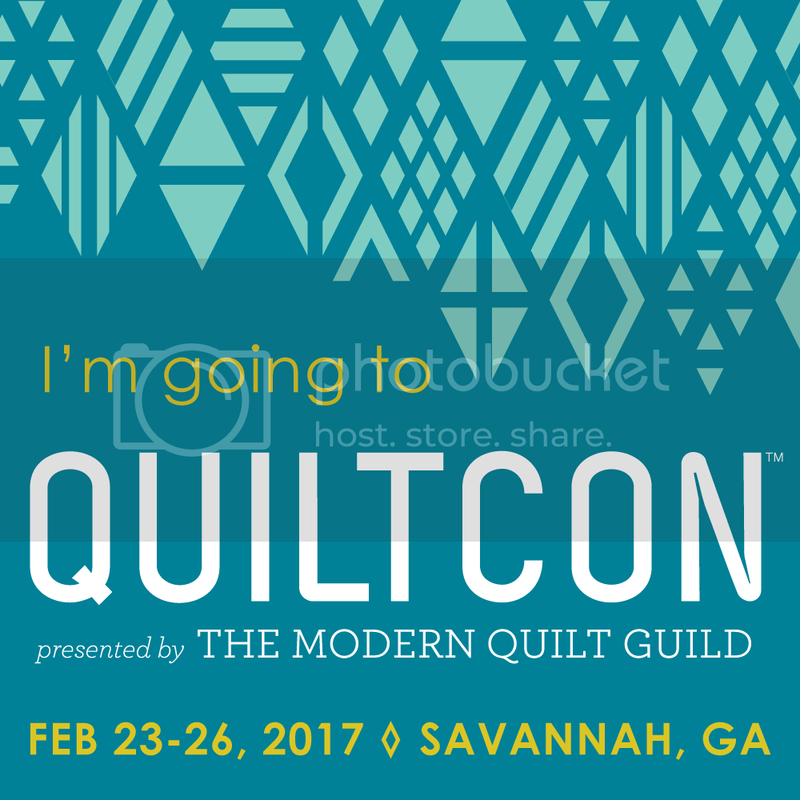 I often have specific colors and shades in mind for a quilt and with the amazing options out there now, finding just the shade I’m imagining is easy. In addition to being easy on the fabric budget, solids (to me) are timeless. Last summer, my grandmother gave me the very first quilt she ever made. She made it when she was thirteen and it is entirely hand stitched. She used only white and a light pink and if someone were to look at it today, other than the slight wear of time, they could easily assume it was made last year. 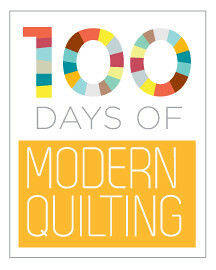 Shea is the president of the Kansas City Modern Quilt Guild and blogs at Empty Bobbin Sewing Studio. You can also see more of her work in her flickr stream. this quilt is so lovely! It would brighten up anybody’s day! And fabulous job on the quilting! So pretty-love your colors and the back is great too! As soon as the page opened, that quilt made me smile! What a happy piece! 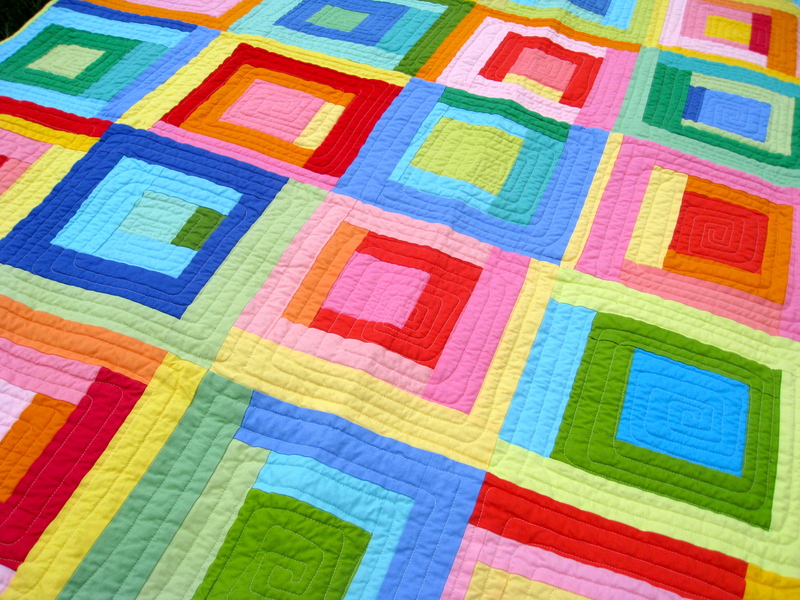 Your quilting looks very nice, too! Love this quilt and your first work on a longarm is very impressive!! Love the bright, clear colors! So cheerful. And your improvisational piecing is just plain fun to look at. If somebody is sad he must look at this quilt. GREAT WORK! Great job! 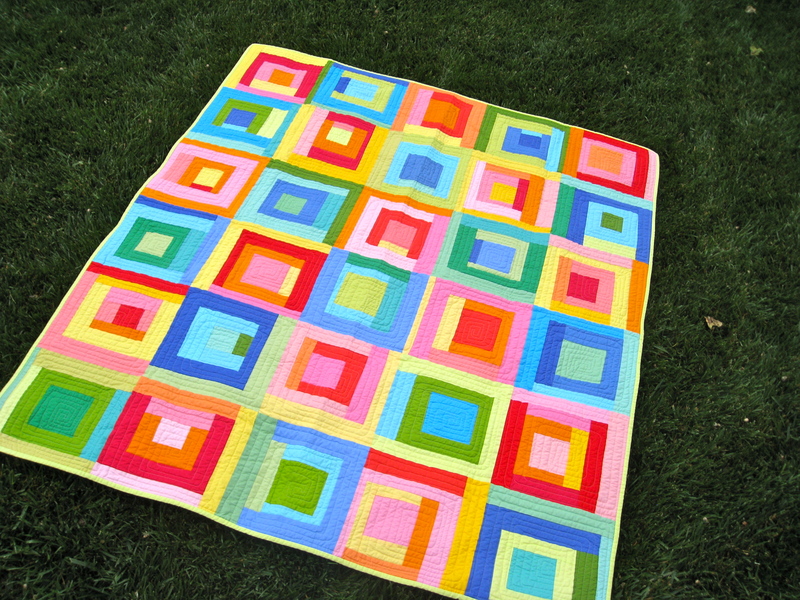 I love the bright colors and the design of the quilt. This kind of color takes my breath away! beautiful quilt! My toes were curling up of sheer happiness and enjoyment! What a pleasure to look at. Thank you so much. Your work is beautiful! Love the colors!! !